Nest to Keep: Finish it Friday...on Sunday! Every time I look at them, they make me smile! 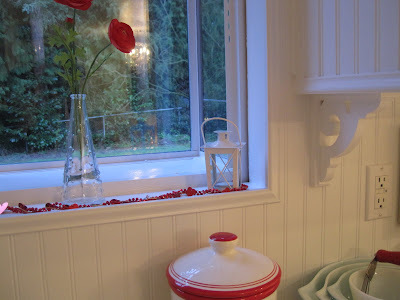 And do you see that the trim around the window is finally up and painted? It was so nice to finish this and it makes the window look so much better! So you can see, it is all coming along, slowly but surely! I haven't put things how I want them in the upper cabinets yet, or hung the little panels that go with the valance, but will soon! We hung the curtains up a little higher than we normally would have, thinking it would be nice to see as much out of the window as possible, but I think they are too high up. Any thoughts on this? Love it, love it, love it! Jenni your kitchen looks fantastic! The vases are so cute on your garden window shelf and the flowers you choose are so much nicer than the ones they had at Ikea. The curtain looks good to me. The vases are SO cute! Now I wish I would've bought some when I went to Ikea with you. Good job on the shutters! 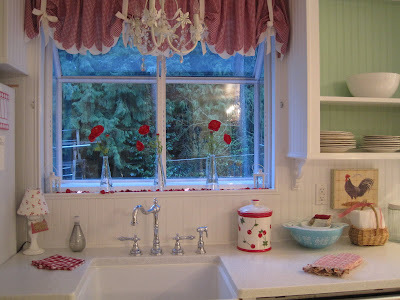 You have the most darling kitchen!! I always hang my curtains higher! I love where they are! Those vases are sweet I am going to have to look for them the next time I go to Ikea! Your kitchen looks great! I love the window treatment. I don't think you hung it too high at all. Your kitchen is looking absolutely awesome! 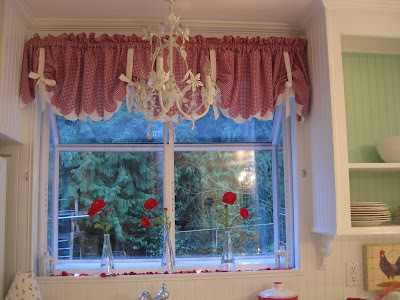 Love the valance and I think it looks just perfect the way it is. LOVE the vases too!!! Jenni you need to tell me where you got your kitchen curtains. I love them. Shoot me an email and let me know. Red and green OR red and aqua?